The Green Gecko - Ashburton Accommodation - Guest Book! To have your guest comments added to this page either enter them onto the listed websites / pages, our Facebook page or emailed to us. Click on the links below to add your comments. Thanks to all those who have sent in their comments we appreciate your kind words. Andrea and I strive to supply a family friendly, warm, clean and tidy place for visitors to Ashburton to enjoy as their home away from home. "A very nice Bach with plenty of space. Conveniently placed near town." ​*Stayed November 2016 - Accommodation - Meg's Place, Ashburton. John and Andrea were lovely to deal with. Easy to contact and very approachable. 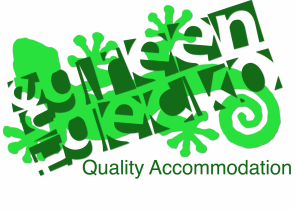 *Stayed November 2016 - Accommodation - Green Gecko House, Ashburton. Lovely place on a quaint and quiet street. Very tidy. Beautifully furnished and within walking distance to amenities. Great location and friendly host. Would highly recommend this accommodation. Thank you, John and Andrea for your hospitality! A lovely place to stay - highly recommended to everyone. Meg's Place was a comfortable, spacious and warm house with a great location not far from the city centre. Definitely exceeded our expectations. Hosts were lovely and helpful, making us feel right at home in Ashburton - would certainly stay again! *Stayed August 2016 - Accommodation - Meg's Place & Green Gecko, Ashburton. We have stayed twice in Green Gecko accommodation - once in Megs Place and then at the Green Gecko House; and we will be back to stay again! Helpful hosts, clean and tidy, quality linen. Quiet location! and really a home away from home. The house was clean and tidy, spacious and warm. john was really helpful. Highly recommended. *Stayed April 2016 - Accommodation - The Green Gecko House, Ashburton. This is a great place to stay, good location, very comfortable and very clean. Weather was good while we were there but I am sure it will be very cosy in winter. *Stayed March 2016 - Accommodaiton - The Green Gecko House, Ashburton. Really good location only a few minutes drive to the centre of town. Nice quiet street with mini market and takeaways a few minutes walk away. Comfortable, clean and tidy 3 bedroomed house with a good kitchen. The owners were very helpful and friendly. Highly recommend this house and John and Andrea. Glenda H. & Chris T. - Queensland, Australia. Everything we needed, cosy but reasonably spacious for four adults. Lots of space outdoors for the kids. Fantastic location, quiet but handy to shops and within a good neighbourhood. The house location was great for us the little shops at the end of the road we great and handy also. I would recommend the Bedrock Stonegrill in the Allenton shopping centre we had a great meal there. What a wonderful place to stay,very clean, all mod cons, and close to shops etc. Off street parking, lovely large back yard, large deck with table and chairs.Great for relaxing and a glass of wine after playing bowls all day. We came down to Ashburton for the weekend, we had a lovely stay at The Green Gecko, it was a lovely and clean accommodation, the beds were made up for us, and we had the cleaning done for us. We really enjoyed the modern feel, and we also enjoyed having sky sport and also the children enjoyed the fact that their was internet. We would highly recommend the Green Gecko. Nice comfortable home with all Mod Cons. Log Burner kept us cosy and the HRV system ensured warmth throughout the whole house. Would recommend to anyone seeking a holiday home in easy walking distance of shops and facilities. The house and flat were ide﻿al for what we wanted (a weekend anniversary break). And while the weather was awful, the house and flat were toastie warm once the heating was going. Well equipped flat and house, from the kitchens to the TVs and sound systems. John and Andreas The Green Gecko is situated in a quiet street in Allenton and it ticked all our boxes especially the Four Square, Bedrock Cafe and Macs Fish. As laptop enthusiasts we had four laptops with us so free wifi a bonus. Many thanks Graeme S, Christchurch. My family and I would like to thank you folks for our stay at The Green Gecko. We had a comfortable stay at the property. - Jeetendra P., Hutt Valley. Our family enjoyed a comfortable stay at the "Green Gecko". Well serviced and friendly owners willing to help make our stay enjoyable, thank you. - Kirstie H., Weedon. We found this accomadation very good. Everything we needed was there and for 6 adults staying for 5 days the living area was great. Our beds were lovely and warm and so comfortable. John and Andrea were excellant to deal with. I would recommend this stay. Lovely house in a great location with shops and restaurant a short walk away. John & his family were excellent hosts and very accommodating, and the house was clean and tidy with everything we needed for our weeks stay. - Carley F.
We needed somewhere to stay while my house was being repaired for earthquake damage. The Green Gecko was perfect. John and Andrea cou﻿ld not have been more helpful. Thank you! Andrea W.
Stayed here for nearly two weeks. Could have stayed a lot longer. Place was awesome! Jordan C, Hinckley, UK. Had a wonderful stay at the Green Gecko. Great place that was able to accommodate my kids, their partners and the grandkids as plenty of room both inside and outside for all. What also made it great was the wonderful weather we managed to have in at the end of June. Warm, comfortable and homely. We would recommend the house to anyone who wants to relax in Ashburton - Patricia F.
Great place to stay. Owners very very accommodating - re arranging beds to suit our needs. Checking that we were happy with the arrangements The sleep out for the teenagers is great complete with own ensuite. Very reasonably priced. I would highly recommend this place to anyone. We will certainly be coming back. Jerry & Katrina. We really enjoyed our stay at The Green Gecko and would definitely choose to stay there again if we come down as a group. The location was ideal -near the wee area of Allenton near family we were visiting. John was very welcoming and accommodating. the house had everything we needed: great kitchen and bathroom, spacious living room and comfortable beds - We would recommend it without hesitation! - Christine S.
This is great place to stay very spacious and quiet and well presented. We will stay again. Great place to stay - spacious and well appointed. Recently renovated with thought and care to ensure a comfortable stay. Located on a quiet street off a main street - which gets you into the central part of town easily. Good shopping centre at end of street. We loved our stay and would thoroughly recommend this property. - Christine L.
Fantastic hosts who were very accommodating ! Highly recommend staying at the Green Gecko. We lacked for nothing and had a great time while in Ashburton. Thank you. Great stay, Andrea and John really went the extra mile for us! We really appreciated it. Great house to stay in, lovely and clean. Will be back if we need a place a again! Annie J. A lovely and enjoyable homely environment. Really appreciated the warm hospitality shown by the owners when we arrived and left.